Songs for equality soon followed. A quick Internet search brought up http://www.protestsonglyrics.net/Songs-about-Womens-Rights.phtml which has a long list of songs, credits, and dates. 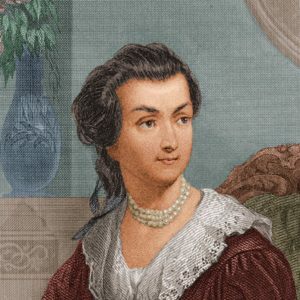 The earliest song I found was “Rights of Woman,” written by “A Lady” in 1795. Unless you are Woody Guthrie or Bob Dylan, the easiest way to write a protest song is to use a well-known popular tune. Half the work is done and people can immediately join in the singing. “Rights of Woman” was set to the tune of “My Country Tis of Thee.” Here are the first and last verses of the song – feel free to sing along! Singing “Daughters of Freedom” requires some skill, but anyone can sing “Auld Lang Syne.” Around 1880 D. Estabrook wrote “Keep Woman in Her Sphere” and set it to that tune. It’s short enough that I’ve included all the verses – I dare you to read them without humming the tune. The second song I found online kept the popular title and tune, “Oh Dear, What Can the Matter Be?” In 1884 L. May Wheeler wrote lyrics listing all the privileges of women until the last verse and refrain. This version is performed by Gerri Gribi. In 1911, Charlotte Perkins Gilman, an author and activist for social reform, wrote “Suffrage Songs and Verses.” The poetry is very much a product of its time (you can judge for yourself) but I bring it up because Ms. Gilman spoke in Geneva for the Political Equality Club. It’s unknown if she did any singing while here. 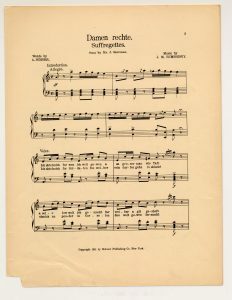 The same year saw the publication of a Yiddish song, “Damen Rechte (Suffregettes).” It was very pro-suffrage as well as supporting equality in many aspects of society. 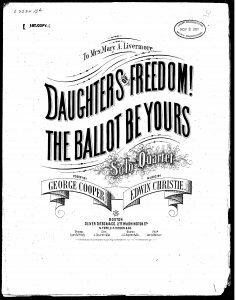 Although the fight for suffrage reached its peak during the gramophone era there are no period recordings of these songs. My theory is that they were intended for rallies and action rather than for listening in a parlor. In 1958 Elizabeth Knight recorded Songs of the Suffragettes for Folkways Records and it has been re-issued on compact disc. It remains one of the few performances of suffrage music.